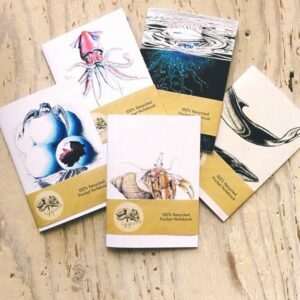 The Extinction Pocket Notebook Gift Box contains 3 of our pocket notebooks, two featuring the Stellers Sea Cow, and one featuring the Great Auk. Each book contains 48 plain pages. The pocket notebooks are a perfect size for putting in your bag or pocket, for making lists, taking notes, sketching and doodling while you’re out and about. The three notebooks will be sent to you in a cardboard box. The Art work is to highlight extinction – the Steller’s sea cow became extinct in the 1760’s and the great auk in the 1840’s. Both at the hands of humans! The notebooks are printed in the UK. All Artwork is from originals by Ian Hughes. These pocket notebook gift boxes make the perfect gift for lovers of the natural world. Box size – 16.6cm x 11.4cm made from FSC® certified cardboard. Postage rates for the notebook gift boxes are £3.40 in the UK with free delivery for orders over £40. Any problems with your gift box, return it to us in original condition within 14 days for a full refund.